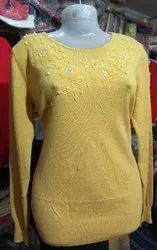 With the affluent acquaintance and practice of this realm, we are actively engaged in offering a wide range of Ladies Knitted Top. 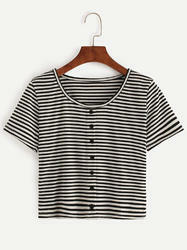 We are the leading manufacturer and supplier of Knitted Tops. - Made in cotton & viscose spandex. Top in 100& cotton fabric with acid wash treatment. Our range of ladies tops are very broad. We also offer plain, printed, embroidered tops in different colours. Made from best quality of fabrics, these ladies knitted tops provide perfect fit and are easy to wash. Available in variety of designs, these tops can be used as daily wear or for special occasions.